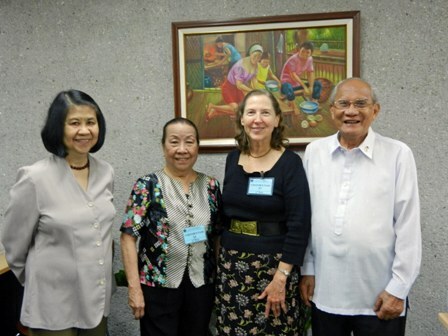 The University of Baltimore and the SERDEF have agreed to work together in proposing and implementing livelihood development projects for Filipino women in disadvantaged communities, under the worldwide New Pathways Program. In a recent visit to the SERDEF office, Dr. Christine Nielsen, Professor of International Business and Strategy and Academic Program Director, M.S. in Global Leadership of the University of Baltimore, discussed with SERDEF officers the University’s “Network-Enabled Women for Innovative Pathways to Enterprise Project,” otherwise known as “New Pathways” which aims to empower disadvantaged women to participate in profitable livelihood opportunities not only to generate added income but also to raise their self-esteem. New Pathways seeks to motivate and mentor poor women to engage in livelihood projects through face to face and computer-aided communications (CMC) with livelihood and human resource experts and successful entrepreneurs and business innovators. In the process, they will have more access to information about livelihood opportunities and higher-value livelihood alternatives as well as develop their decision-making skills. New Pathways has worked with Zonta International in advancing the status of women worldwide. In the Philippines, it has offered IdeaShops TM for women in two agricultural communities in Negros. Dr. Nielsen was in turn briefed by Dr. Paterno V. Viloria, SERDEF president, on its own programs and projects as a resource hub for micro, small and medium enterprise development in the Philippnes. Also present during the visit were Dr. Herminia R. Fajardo and Ms. Serenidad Lavador, SERDEF trustees.